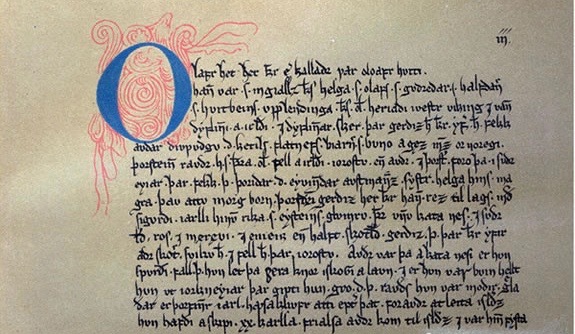 The Icelandic sagas, written during the High Middle Ages, constitute a significant body of work of the medieval Icelandic literature, alongside the eddas and the skaldic poems. These manuscripts were mostly penned by anonymous authors, whose identities were either not revealed or remained very much obscure in the passing of time. However, these medieval literary creations innovated in that they revolved around the lives and deeds of real common people and their genealogies, as opposed to the largely moralistic, fairytale-like writings of the time in mainland Europe, where the main characters were knights or princes. The legacy of the sagas continues to live on up to our times, having inspired, among others, the setting and the mythical races of major high fantasy novels such as those from ‘The Lord of the Rings’ trilogy by J.R.R. Tolkien. Below is a list of ten epic medieval Icelandic sagas that one should certainly read up if interested in the literature of the Middle Ages. Please bear in mind that this is a list, not a top, and that there are plenty of other sagas worth reading as well (this being more of a introductive selection). The sagas of Erik the Red and of the Greenlanders recount the Norse discovery of North America at the round of the 11th century. In Erik the Red’s saga, Vinland, as the newly discovered territory was referred to in Old Norse, would rather soon become the battlefield of the native American populations (called ‘Skrælingar’) against the recently settled medieval Scandinavians. Both in Erik the Red’s saga as well as in that of the Greenlanders, other locations known to the Norsemen across the North American territory are revealed as Markland and Helluland. The saga of the Jomsvikings deals with the story of a semi-legendary order of Norse warriors and the foundation of their stronghold seat – Jomsborg. Variations exist between the five known different versions of the manuscript that were printed along the time’s passing, but the central theme revolves around the warrior code of the order and their laws. The saga of the Faroe Islands (also known as the Saga of Thrond of Gate) describes how the small archipelago located at the crossroads between the Norwegian Sea and the North Atlantic Ocean became an integral part within the Kingdom of Norway and how its Norse population converted to Christianity. The saga of Egill Skallagrímsson depicts the destinies of a skilled warrior and skald’s forefathers, sailing from Norway and settling in Iceland, spanning for roughly 150 years. It may have been written by Snorri Sturluson, given stylistic similarities with the Heimskringla (the sagas of the Norse kings). The saga of Gisli the Outlaw is one of the best Icelandic sagas on family feuds. It is set along the late 9th to late 10th century, centering around the turbulent times of early Norse settlement in Iceland. This saga inspired a film of the same name in 1981. Dating to the 13th century, the saga of the people of Laxárdalr is about the medieval inhabitants of Breiðafjörður shallow bay in western Iceland, involving romance, pride, and cruelty, over the late 9th century until the early 11th century. To this day, it remains one of the most critically acclaimed sagas for its poetic beauty. Recounting events that took place between late 10th to early 11th centuries, the saga of Burnt Njáll presents an intriguing family feud set in early medieval Iceland. It is the most voluminous and highly developed (in narrative terms) saga of the Icelanders, considered one of the finest of its kind. As part of the sagas of the Icelanders, the tale of Grettir the unlucky outlaw and of his family centers around events that took place both in Iceland and overseas, in such places as Ireland, Norway, or Byzantium. A peculiarity of this saga is that Grettir is not involved in the Viking raids, very much unlike other main saga characters. Heimskringla is by far the most significant sagas on the lives of the Norse monarchs. It starts with the semi-legendary Swedish Yngling dynasty and continues with the reigns of Halfdan the Black, Harald Finehair, Haakon the Good, Harald Greycloak, and other kings of Norway, highlighting their achievements regarding the fate of their subjects. You didn’t include one of my favorites, perhaps because it isn’t, strictly speaking, a saga: The Tale of Sarcastic Halli. A vivid portrait of the interaction between Harald Haardrada and a skald/retainer with great talent and unlimited guts.